It’s time to speak out in defense of Greater Chaco again. 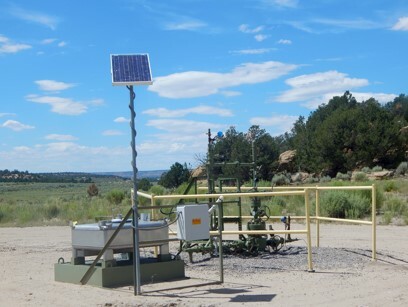 The Bureau of Land Management (BLM) Farmington and Rio Puerco field offices in northwestern New Mexico continue to allow oil and gas companies to frack without a plan in the Greater Chaco region. Once again the BLM is offering dozens of parcels for lease in Greater Chaco this March. They are pushing ahead with this lease sale despite the recent federal government shutdown, during which they provided no information to the public about the sale. Over 93% of public lands in northwestern New Mexico are already leased for oil and gas development. There is NO plan for protecting the air, land, water, cultural resources, or communities. Communities in the Greater Chaco experience myriad impacts from existing oil and gas extraction, including increased respiratory problems, poor air quality, destroyed roads and unsafe traveling conditions, damage to sacred landscapes, and much more. 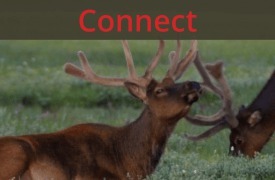 Time and time again, the BLM has failed to meet its commitment to consult with tribal governments and impacted communities, and to conduct the required cultural study of this unique landscape. In fact, one year ago then-Interior Secretary Zinke deferred the March 2018 lease sale, admitting that there had not been sufficient cultural consultation and study in the Greater Chaco region. But to date, there has not been a single attempt by the BLM to survey over 5,400 cultural resources in the region. Under the Trump Administration, the BLM has rolled back opportunities for public involvement. The BLM has shortened public comment periods, constrained options for comment submission, and completely eliminated comment periods for draft National Environmental Policy Act analyses. For this lease sale, the public has only 10 days to submit protest comments and they cannot be emailed, so we need you to act fast to tell the BLM to cancel the March 2019 lease sale. We will print out your comment and make sure it gets hand-delivered to the BLM State Office by the February 20th deadline. BLM has failed to meet its commitment to consult with tribal governments and impacted communities, and to conduct the required cultural study of this unique landscape. It is irresponsible to continue leasing before completing a meaningful process of consultation and study. 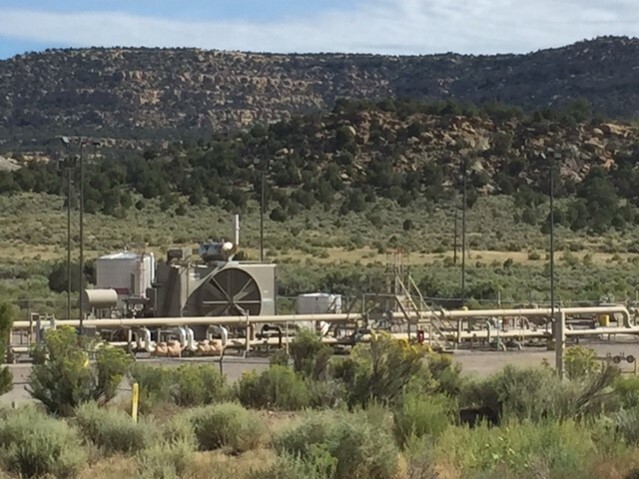 With 93% of the region already leased, communities are already hit too hard with the negative impacts of oil and gas development, including public health consequences from poor air quality and unsafe travel conditions.The BLM must take a hard look at the public health consequences of oil and gas development in New Mexico before issuing further leases. The BLM should not be approving any leases until the Farmington Field Office completes its Resource Management Plan Amendment and until the Rio Puerco Field Office completes its new Resource Management Plan to analyze the impacts of horizontal drilling in the region. The BLM needs to provide the public with more time to submit comments on lease sales. The reduction of protest periods from 30 to 10 days is unacceptable. The BLM must consider recent climate science in making leasing decisions. Join SJCA and partners at the New Mexico Public Lands Rally on February 20th, where we will gather all protest comments for the March 2019 lease sale to be delivered to the BLM. Oil/gas is the past. Let’s move to our renewable future! Sorry, this was confusing, but you need to click on the RED text in the blog to download a form, complete it, and email it to Sonia@sanjuancitizens.org. Unfortunately, the BLM is not accepting electronic protest comments. Thank you for taking the time to do this! 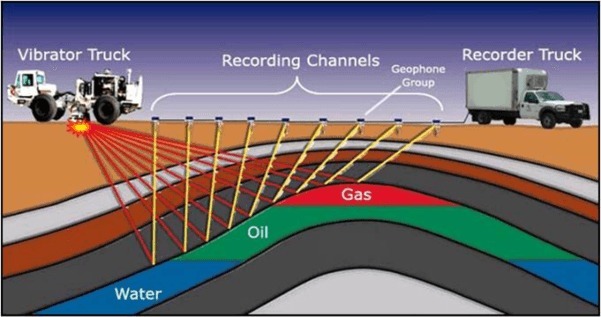 Gas and oil drilling should not take place in this area. Please preserve this precious area. Apparently there have not been sufficient studies of the entire cultural treasure there. It’s inappropriate to lease any lands until a thorough studies have been completed and considered. My family friends and I fully believe that the BLM has failed to meet its commitment to consult with tribal governments and impacted communities, and to conduct the required cultural study of this unique landscape. It is irresponsible to continue leasing before completing a meaningful process of consultation and study. With 93% of the region already leased, communities are already hit too hard with the negative impacts of oil and gas development, including public health consequences from poor air quality and unsafe travel conditions. The BLM must take a complete and fully hard look at the public health consequences of oil and gas development in New Mexico before issuing further leases. Also, the BLM needs to provide the public with more time to submit comments on lease sales. The reduction of protest periods from 30 to 10 days is unacceptable. Finally, the BLM must consider recent climate science in making leasing decisions. Sorry, this was confusing, but you need to click on the RED text in the blog to download a form, complete it, and email it to Sonia@sanjuancitizens.org. Unfortunately, the BLM is not accepting electronic protest comments. Thank you for taking the time to do this and your thoughtful comments. The greater Chaco area needs a plan so that cultural issues are addressed, along with air quality. The general area is already inundated with wells and roads. There is no shortage of oil and gas coming from this area and others. The roads in that area are treacherous when wet and get destroyed when traveled under wet conditions. Where is the plan? No more oil and gas because it is causing problems to the environment and we really need to protect it no matter what with clean air to breathe and clean water to drink because oil and gas drilling are unacceptably dangerous to the environment so please shut it down and replace all of it with clean renewable energy for a better future. Sorry for the confusion, but you need to click on the red text in the blog and a form will download. Please complete the form with your comments and email to sonia@sanjuancitizens.org. The BLM is requiring that comments be physically submitted. Thank you for taking the time to do this! 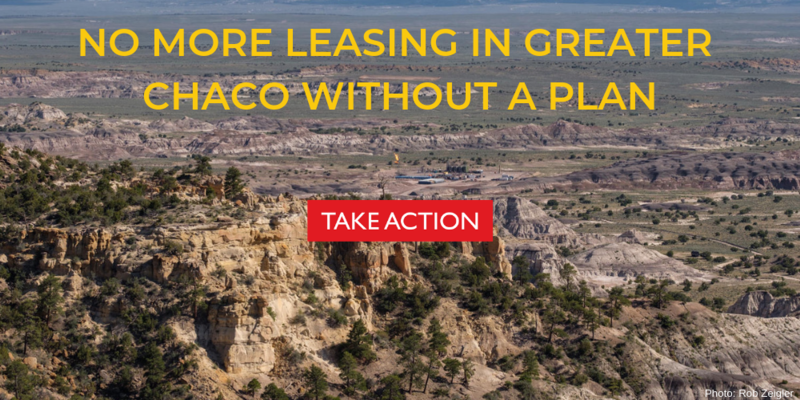 Do not lease land to oil and gas or to any business endeavor in or near Chaco Canyon. The greater Chaco area must be protected from any further drilling. Chaco is sacred by Native Americans and any further encroachment has to be stopped with 93% of the surrounding area already have been leased to the oil and gas industry. It also is a World Heritage site invaluable to all people, especially to future generations. Chaco is sacred and we must care for the Ancient Lands as time goes on. For the sake of our children, do not it destruction happen. Sorry, this was confusing, but you need to click on the RED text in the blog to download a form, complete it, and email it to Sonia@sanjuancitizens.org. Unfortunately, the BLM is not accepting electronic protest comments. Thank you! To destroy this ecosystem so private corporations can profit is unforgivable. These lands belong to We, the people and are NOT for sale. To discount tribal consideration is unconscionable. They will be most impacted and have rights that demand consideration. Reducing the comment period from 30 to 10 days in unacceptable and makes this whole deal look particularly shady. It’s unthinkable; We have clean energy knowledge & we should be investing n that not dirty energy; This isn’t the dark ages! The greater Chaco area must be protected from any further drilling, especially without completing the requisite assessments. Chaco is sacred to many and invaluable to many more given its natural beauty and cultural resources, including being a world heritage site. Please halt any future lease sales. The local people don’t want this, and they’re paying the price with desecrated landscapes and poor health. Lovers of – and visitors to – this incredible archeological area don’t want this, and will begin taking their very valuable tourism dollars elsewhere. Even the Mayor of Aztec has said, Enough is Enough, Let’s Diversify. Let the process be followed – let the Resource Management Plans be completed and proper public input received. Let the good employees of the BLM not be accused by future generations of being as money hungry as the corporations it apparently represents. I have visited the Chaco area several times and it deserves to be respected and protected. 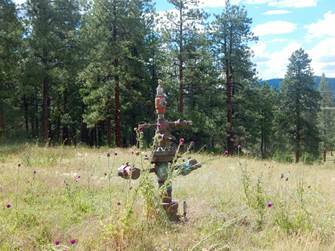 The BLM should not issue any permits for drilling until the tribal governments and impacted communities are consulted. More than 90% of New Mexico is already leased for petroleum development. Reducing comment periods to only 10 days is a blatant attempt to ignore the public who are the owners of this public land. The reckless mismanagement of rogue methane has to stop. If the BLM continues with the next sale before proper methane capture rules are enacted, then the BLM is equally responsible for the mismanagement of the land they are supposed to manage. Thank you for setting this up for us to communicate with the BLM. 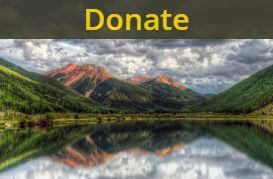 It’s outrageous that the fossil fuel industry has succeeded in making it very difficult for citizen’s to provide input/comments about our public lands! I will spread this link so that others can get their comments in. Sorry for the confusion, but you need to click on the red text in the blog and that will download the form you need to fill out. It should be in your downloads folder. Please fill it out, then email to sonia@sanjuancitizens.org. Thanks! Do not allow Chaco to become a sacrifice zone. The worst tactics of dictatorship can be seen in the Trump cultists’ actions regarding Chaco. This is our heritage, perhaps the birthplace of our own civilization, the demonstration of human community, remarkable intelligence, and the location of the indestructible quality of human culture. How can we allow the Trump cultists to destroy this for their own private profit. We must find ways to protect Chaco.